If you are yet to join the air frying revolution, the Hot Electric Bella Air fryer may seem a basic and affordable entry opportunity for you. Many of us would have heard of air fryers by now, they offer the perfect way to fry your favorite dishes with little or no oil. This particular air fryer will use as little as a tablespoon of oil if you need any to fry your food, reducing the fat content by as much as 80%. How is it able to do this? Why do we think you need it, check out everything below in our Bella Air Fryer reviews. 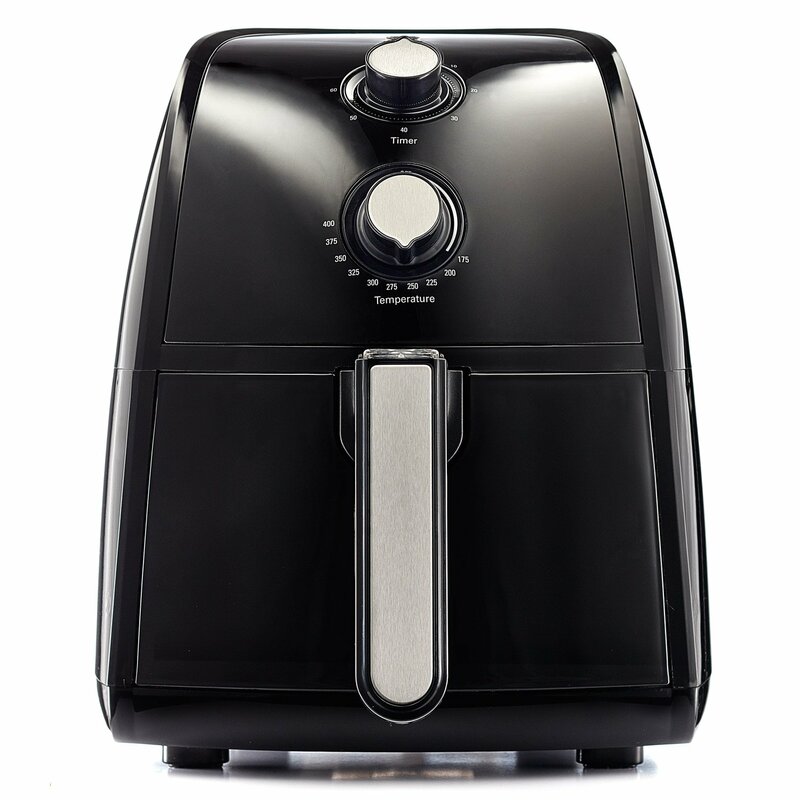 Compared to many other air fryers, the air fryer is very compact and still has a capacity of 2.5 liters. The air fryer uses a convection fan and works by circulating hot air around the food at high speed to prepare an evenly cooked, crispy and delicious meal without the use of oil. The air fryer has a manual control that is easy to use and weighs about 10lbs with a dimension of 14.2 x 11.4 x 13.2 inches. 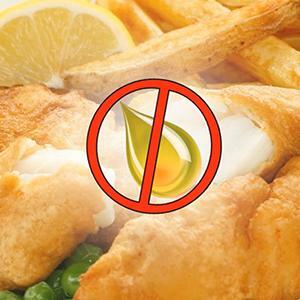 If you are still not convinced by the wonders and benefits of this technology, it would be good to know that foods prepared using air fryers contain up to 80% less fat compared to deep frying. The reduced fat content helps to reduce the risks of medical conditions such as diabetes, heart attack, obesity and several related diseases. The Circular Heat Technology employed in the Bella Air fryer ensures the heated air is properly circulated which in turn leads to an evenly cooked delicious and fried food with the crispy outer layer. The Bella Air fryer has a lot of features intended to make your user experience a hassle-free one, check out the following features in our Bella Hot Air fryer reviews. Capacity: The Bella Air fryer is able to accommodate up to 2.5 liters of food in the cooking basket despite it being portable and compact. This is enough to serve a group of two to four people depending on the type of food. 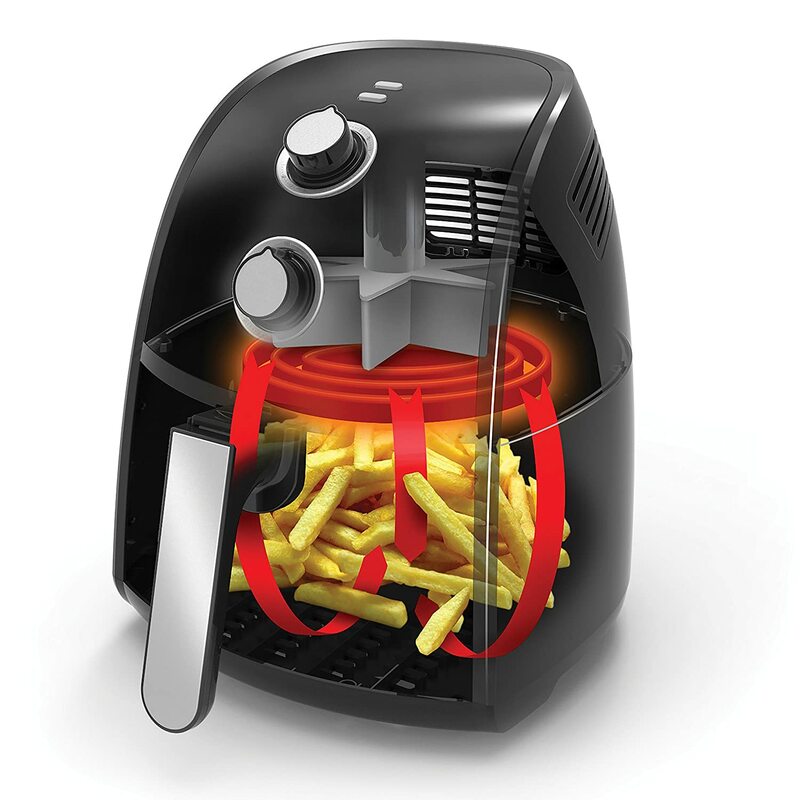 Easy to Use: The Air fryer features manual controls for easy use. The basket is also removable and dishwasher safe for easy cleaning after use. Power: The Air fryer boasts 1500 watts of power, excellent for an air fryer of its size. Temperature: The temperature is manually adjustable with manual controls and ranges between 170F to as high as 400F. This can be adjusted depending on the type of food you are dealing with and how you’d like the end result to be. 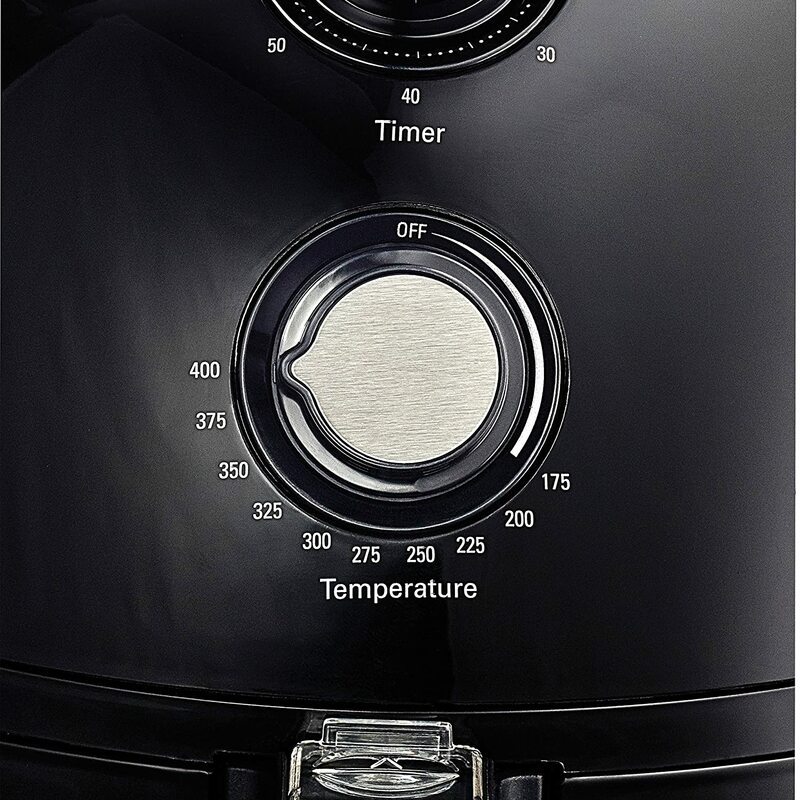 Controls: The Air fryer has knobs for setting time and temperature, it also has two indicator lights to indicate when power is on and when cooking is complete. Safety: It features an inbuilt automatic timer that shuts off cooking after 60 minutes of inactivity. This safety technique ensures you do not experience burns or overcooking in any way. No oil cooking: The Bella Air fryer is capable of delivering crispy and tasty results with your foods without the use of any quantity of oil, safe and healthy. Aside from the cooking basket and the instruction manual that comes alongside the air fryer, there are no particular accessories made for the Bella Hot Air Fryer. However, there are air fryer accessories you could easily check on Amazon, you will only have to be sure of the size and measurements of your cooking basket to be sure they will fit into your air fryer. Replace it back in and set the time and temperature and that’s all. Your favorite meal is ready to be enjoyed without the calories. Cleaning can also be done easily by removing the dishwasher-safe parts for cleaning after each use. It is easy to use and clean because of the removable dishwasher safe, non-stick frying basket. The air fryer has an affordable low price compared to many others. The manual controls are very easy to understand and use. It has light indicators for specific notifications during cooking. The air fryer is more durable due to it being a mechanical/manual air fryer. It is able to cook faster due to the fact that its heating elements are made from stainless steel. While we can say that the Bella Air fryer is almost perfect, there are few of issues as regards the use of this amazing air fryer. Some users have noticed a kind of smell when using the newly bought Bella Air fryer. Even though this is a fairly common issue, it can be simply rectified by properly following the manual instruction that says you should thoroughly wash the dishwasher-safe basket before the first use. A thorough cleaning would solve this problem. Also, the air fryer comes in only one color, black. Some users also find the 2.5 liter capacity of the air fryer too small. Verdict – The air fryer is a perfect entry-level air fryer if you are seeking to jump on the air frying train. With its minimalistic design, it guarantees you a better alternative to traditional deep frying, cooking with less or no oil. It is great for the price and perfect for those who are seeking to enjoy the benefits of air frying without breaking the bank. Air fryers offer a better way to enjoy the same delicious and crispy meal without the excess fat that comes with deep frying. As such, they should be on the priority list of every person who wants to eat and stay safe. Bella Air fryers offer the basic qualities of modern air fryers without being overpriced, the Bella Air fryer Amazon price is another reason to convince you that this is the next way to go, with such an affordable price tag, it ranks among the best air fryers in the market despite the simple and basic design.